Just updated the zip file that contains all the sprites - a few of the creatures had the wrong sprites. Please re-download it. Hi, can you give me access? Every creature in the game, including the gods, will have an alternate color scheme available for players to very rarely find in the wild. Creatures that have this unique color scheme are called "Singular Creatures". If you've ever played Pokemon before, these work exactly like "Shiny Pokemon". We want each Singular Creature to have a really unique color scheme. It should look VERY obvious to players that the color scheme is unique compared to all other creatures. Albino Wolpertingers, brown Trolls, and pink Imlers are along the lines of what we're looking for. In order to re-color a creature, we'll need a palette file for each one. 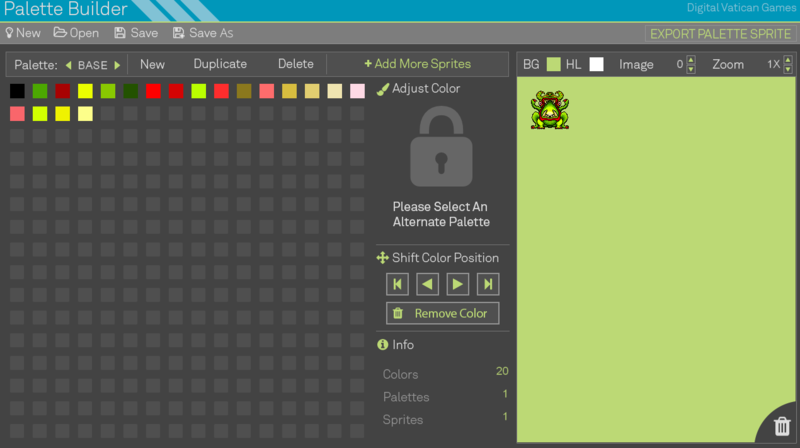 A palette file simply tells the game which colors to swap out on a given creature sprite. It's very easy to create a color palette! I'll try to make these instructions as clear as possible, but if you have any questions or concerns, feel free to reply to this topic. 1) A .zip file containing all the battle sprites and overworld sprites for every creature in the game. Extract these images to a folder somewhere on your computer. Download. 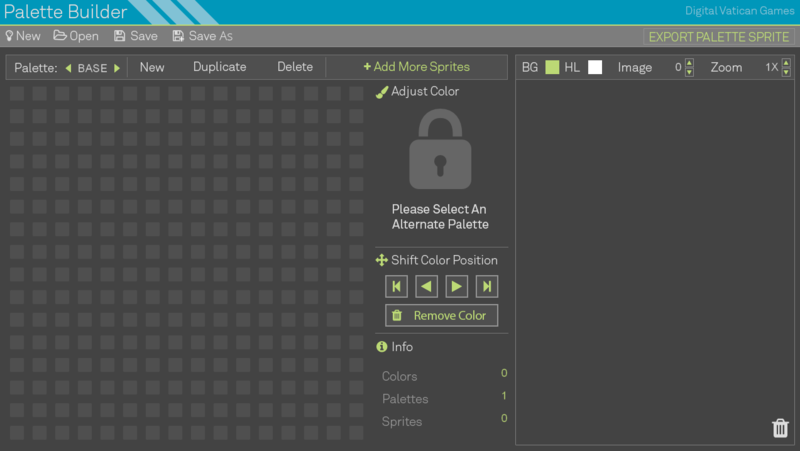 2) The palette creation tool (created by Digital Vatican Games). Windows only, sorry! Download. Anyone can view the spreadsheet, but in order to edit it, you'll need to request access. I'll need your e-mail address to give you access, so you can either post it here, PM it to me on these forums, or e-mail it to me at [email protected]. Now, it's time to create a palette swap file! First, we need to decide what creature we want to create a palette swap for. Let's try the Berserker Fiend first. Click "Add More Sprites" at the top of the window. Browse to where you extracted the creature images, and choose "Berserker Fiend.png". This is the creature's battle sprite. You'll be asked if this sprite is a strip. Leave it at the default value (1) and click OK.
You'll be asked if the background is transparent. Click "Yes". Now that we've added the creature's battle sprite, we need to add its overworld sprite as well. Again, click "Add More Sprites" at the top of the window. This time, choose "Berserker Fiend OW.png". This created a new palette with the same exact colors as the first one. We'll want to leave the first one intact because that tells the game what the original colors are. So, whenever you're changing the creature's colors, make sure you're working with "Palette: 1" and NOT "Palette: BASE". Yep, the overworld sprite has blue lips too. 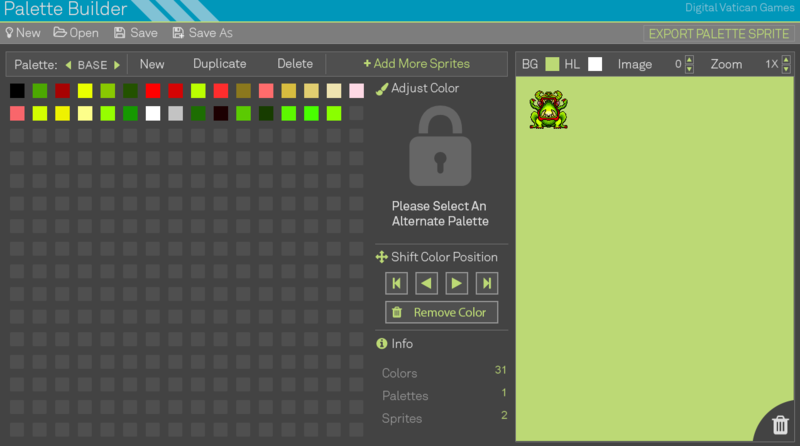 Sometimes we won't be that lucky and we'll need to adjust a few more colors, so make sure you check both sprites. Once you're satisfied with the work you've done, simply click "Export Palette Sprite" at the top and choose an easy location to save it. Please name the file after the creature's name. For example, I'd name mine "BerserkerFiend" to make things easy. The easiest way to take a screenshot is to download a free tool like Gyazo. Any way you want to do it is fine though, as long as we have a link to view the screenshot. Now it's finally time to submit the palette so we can use it! Head over to the spreadsheet I mentioned earlier. "Sample Image (Battle)" should contain a link to the screenshot you took of the battle sprite. "Sample Image (Overworld)" should contain a link to the screenshot you took of the overworld sprite. "Author" is how you want to be credited in-game for your contributions. If you contribute at least one palette swap, you'll be added to the credits list in the library. "Forum Link" is a link to the palette file itself so we can download it. The easiest way to upload a palette file is to create a new topic on this board and upload it as an attachment to your post. And that's it! We'll review the palette swap and make sure it's good enough to be added to the game, and if so, we'll mark that creature as "completed". Otherwise, we might need to reject it - if so, we'll simply delete it from the spreadsheet. If you're going to create another palette file, make sure you click "New" at the top of the palette tool (the button with the lightbulb next to it) and start a fresh project. Otherwise, you'll be working on multiple creatures at a time which won't work out very well at all. Any questions? You can always post here, e-mail me at [email protected], or ask for help from someone on Discord. One final point: these won't be implemented into the game until there's one for every creature. Otherwise, I think it would be very frustrating for players because some might use 100 Charms to try to find a creature they want, only to eventually realize that there's not a palette swap for that creature.